It’s difficult to go anywhere without being presented with the opportunity to extend or refresh your tree and plant knowledge, even in urban environments. Previously I’ve written about urban botanising and making the sharpening of your tree and plant identification skills part of your daily practice. So it was the other day when I was up in London for a day of photography, familiarising myself with a new camera. It’s likely that regular readers of my blog will have recognised photography is one of my passions and one that I love to combine with writing to produce articles here, on this website and for print publications such as Bushcraft & Survival Skills Magazine. We had chosen a couple of iconic London landmarks – the Thames Barrier and Tower Bridge – as our main photographic subjects for the day. 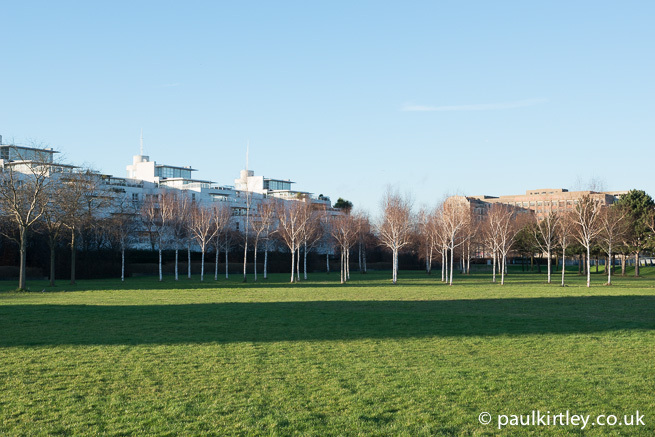 Riverside viewing of the Thames Barrier from the north side of the river is via Thames Barrier Park, a 34-acre landscaped green space on regenerated land in the historically industrial area of Silvertown. Even in winter it is a pleasant space to visit, an oasis of green. The park contains many interesting species of trees and plants. It was a sunny yet chilly afternoon. 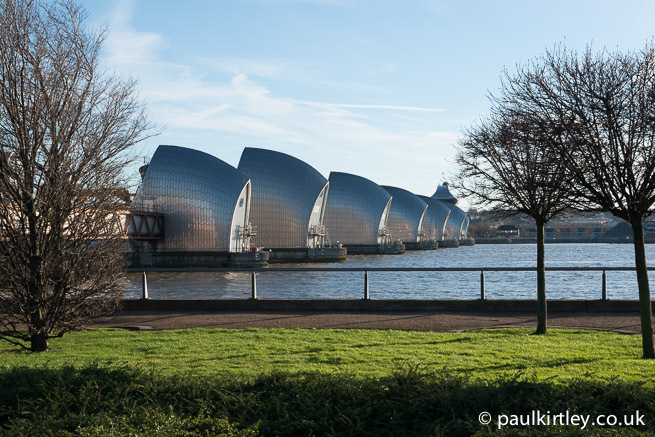 We spent some time down by the river taking photos of the Thames Barrier itself. We then explored the park a little. 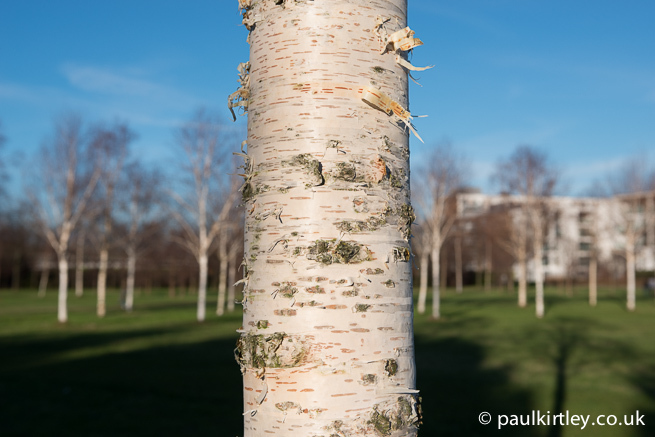 With bare branches and light bark illuminated by the low-angled bright sunshine, the park’s birch trees stood out in stark contrast. Birch bark illuminated by the low-angled bright sunshine. Photo: Paul Kirtley. 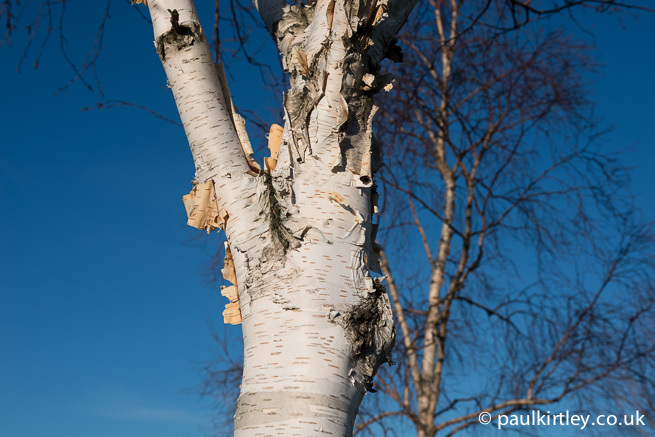 The birch bark here is particularly noticeable as many of the birch trees in the park are Himalayan birch, Betula utilis, commonly used by landscapers due to its attractive nearly white bark. I love the straightforward scientific naming of this tree; like our native silver birch, Betula pendula, Himalayan birch is very useful – it has great utility. 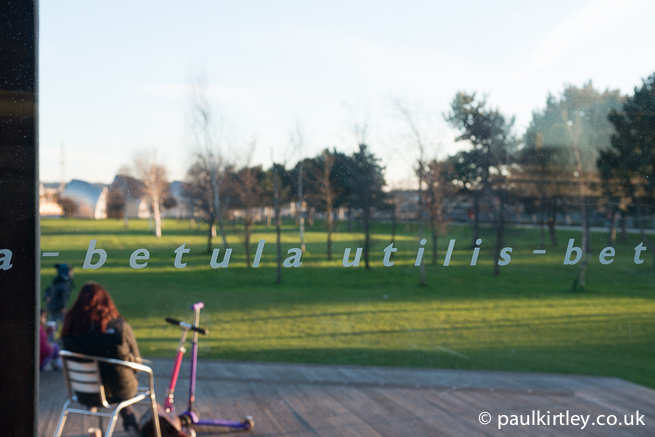 Hence the Latin name utilis. Himalayan birch, Betula utilis. Photo: Paul Kirtley. As the breeze coming off the Thames started to chill our bones, we retired to the visitor pavilion. 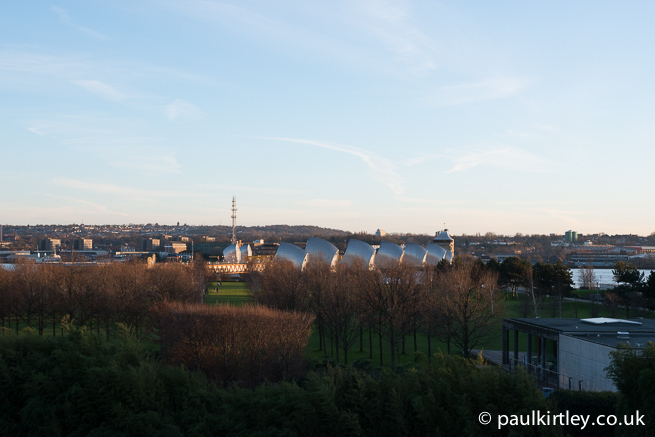 This modern building contains a light and airy cafe with floor-to-ceiling glass leaving little to obscure views of the park. Here, as we drank our coffee, we were literally surrounded by tree and plant information. The large panes of glass in the cafe windows are etched with the scientific names of many of the species planted in the park. Scientific names of trees etched onto the glass of the visitor pavilion. Photo: Paul Kirtley. After rewarming, we headed out again to catch the Docklands Light Railway from Pontoon Dock into Tower Gateway. The Tower of London and Tower Bridge are only a short walk from here. View of Thames Barrier Park from Pontoon Dock DLR station. Photo: Paul Kirtley. Throughout the afternoon, the sky had cleared and the temperature had dropped. Now, as the light faded, we had wonderful clear views of the London skyline, with very little haze – great photographic conditions. Even here amongst the concrete and tourist crowds, nature isn’t entirely absent. Around the Tower of London are some majestic London Plane trees, Platanus x acerifolia. The Shard, framed by London Plane trees from near to the Tower Of London. Photo: Paul Kirtley. Tree and plant knowledge really is all around you. You can see the more urban photos from the day here. Stunning Pictures Paul! It is great to see both natural and urban environments existing almost as one. Well it is good to see that the need for green space is recognised during the rejuvination of brown field sites such as this. With regards to the Himalayan Birch; do you know roughly how long ago it was introduced to Britain? I read it was in the 1880s Joe. 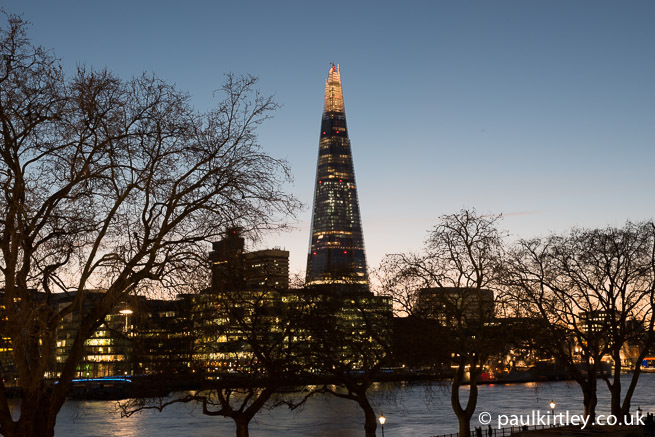 Looks like a great day out around the big smoke Paul, some lovely photos. Quick question, you’ve stated that the botanical name for London Plane is Platanus x acerifolia, which according to Wikipedia is correct, However, I’ve always known London Plane as Platanus x hispanica, which according to the Kew Gardens website is correct. I understand that botanical names can change over time, which is presumably what has happened here, I was just wondering which name is the more up to date one. Any ideas? Good question. As far as I’m aware Platanus x hispanica and Platanus x acerifolia are synonyms. Certainly in biological circles, it seems they are used interchangeably, such as here vs here, to pick a couple of random examples, and appear to be considered synonymous. Looking at some of the accessible tree identification guides such as this or this, both are listed, albeit Platanus x hispanica is listed first. Thanks for that Paul. Having glanced at various tree books I’ve seen the same thing, x hispanica listed first with x acerifolia listed as a synonym. I agree with you, x acerifolia is a better name. If anything x hispanica is somewhat misleading.